Way, way, way back in April and May, Grace, the flighty Angel in Training main character from Winging It!, interviewed a whole bunch of authors. But there were two particular favorites of mine who were left out: Kai Strand and Guido Henkel. So, we’re going to resurrect (please excuse the pun) the interviews. Today, you’ll have the chance to get to know Kai a little better. And on Monday, please look for Guido’s interview. Okay, time to turn the reins over to Grace. Hey Kai! It’s really great to meet you, especially since I already got to know your MC earlier this year over at your blog. Let’s get started. Your Muse must be doing a great job inspiring you. What’s the next project they’re helping you out on? I’ve been tapping into my teenage muse’s mind recently to work on a new young adult novel. A boy, a girl, lots of sweaty palms and palpitating hearts. It’s fun. 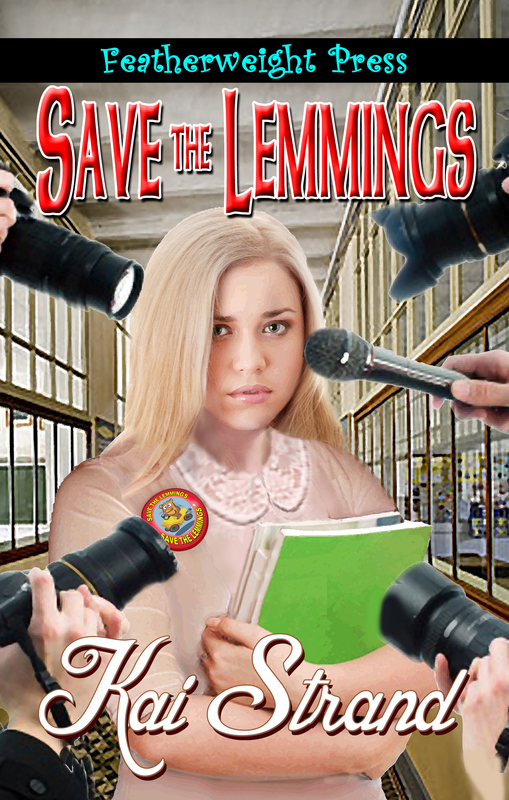 I’m an incurable priss, so is Natalie, the main character in my new tween novel, SAVE THE LEMMINGS! I’m not intelligent like she is, though. Luckily for me I had great friends growing up, who managed to overlook my need to not only follow rules but also enforce them. Natalie’s friends are the same. They tease her a bit, but truly it’s why they love her. I get that. Natalie kind of grew on me, too, by the end of the interview in April. Um, my author makes me ask this next question. You don’t have to answer it, but you probably will if you’re a by-the-book gal. Do you have a favorite book? Of all time? I don’t do favorites because they change with my moods or the weather or life’s circumstances. But I have a healthy appreciation for Harry Potter, Goblet of Fire. Emotional, epic, harrowing, sweet, heartbreaking and there’s a dragon. It is such a complete tale. And it’s soooo long, too. Okay, changing topics. In your opinion what makes a guy character swoony-worthy? It’s the little things; hands touching, lingering look, barely there smile. Oh and really good hair. Dude, the true rockers aren’t dead yet. AND they’re still rockin’. Look at Steven Tyler! I know, dude. He looks like a lady and has good hair! Seriously, even though I am a rocker, I’d actually want to see Mozart. What I wouldn’t give to see him in action. To watch him be transported into his own music would be the ultimate. I’d really love to watch him compose. But I would need his thoughts to play out loud. Does he hear the full symphony or each individual instrument? It’s confession time. What’s your biggest writing sin? Remember that admission about me being an incurable priss? Not being able to break rules? I believe I said I remembered. Yeah, I’m not one to have big confessions. I’d say my biggest ‘sin’ is lack of writing discipline. Since that is so boring, I’ll move on to the next question. Okay, and sorry if I seemed a little rude there. We actually have a group of undisciplined writers from the first set of interviews. (If you missed them the first time they started here., but please finish Kai’s interview before you go linking off.) 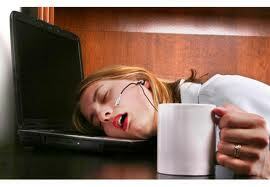 They call themselves procrastinators and my author is guilty as sin. Now, I think I know the answer to this one. Are you more of a rule follower or a rebel? As previously stated – rule follower. HA! You got me. But, why? I have no idea why. I have a son who is like me and I always feel a bit sorry for him because I know he’ll never be able to truly relax – unless it is written into the rules somewhere. Aww…that makes me kinda sad, too. Okay, I’m going to write one for him, and you too. Kai and her son, I command you to relax. *whispers* This doesn’t carry the same weight as if it came from The Big Guy, himself, but I am an Angel in Training, y’know? Besides, it’s such a priviledge to be able to help you Humans out. Now, what — other than your Muse, of course — inspires you? Music, nature, children, joy, reading, necessity. I love that! Especially the thing about necessity! And, what do you want readers to take from your books. I want readers to know that the choices life presents are sometimes really flippin’ hard to decide on and even harder to act on. It’s important to pull up the proverbial bootstraps and do the hard work. My middle grade novel, The Weaver, is about a girl who can’t get better at telling stories until she applies some hard work and persistence. My upcoming novel, SAVE THE LEMMINGS!, is about a girl who has to restore her reputation after being the recipient of media bashing. But I said sometimes. When the choices aren’t hard, readers should enjoy their life, their love and their blessings, which both girls do in my books. That is really awesome, Kai. Life isn’t easy, even for Angels. Is there anything you’d like me to mention to yours? I mean your Guardian Angel. ‘Cause I totally have contacts. Can you please tell him or her what a rock star I think they are? I’ve never broken a bone and have only a few gray hairs. I stay calm during a crisis and only fall apart after safety is restored. The only thing I’d ask is if they see my metabolism (which died and went to heaven a few years back), could they somehow restore it to me so I can eat all the pizza I want again? Those days I miss. That’s really nice. It sounds like you have a Guardian that works as hard as you do, and, I’ll see what I can do about the metabolism-pizza request. Thanks for hosting me today, Grace! If your readers would like to know more about my writing and me, they can visit www.kaistrand.com. I can also be found on Facebook and Twitter (@KaiStrand). You are very welcome, Kai and I’ll turn you back over to Shel now. Kai, thanks so much for mentioning where you are on the web and I’d like everyone to know they can find SAVE THE LEMMINGS here. And your second new release—you’ve been very busy this summer— THE WISHING WELL here. I haven’t had a chance to read either of these yet, but I did read THE WEAVER and it was beautifully written. So, check ‘em out and then come back on Monday for my friend, Guido. September 7, 2012. Tags: author interview, guardian angel, Kai Strand, Save the Lemmings, Shel Delisle, Steven Tyler, The Weaver, The Wishing Well, Winging It!. author interviews. 1 comment. I’ve just about wrapped up the blog tour. This is how I’m feeling. Okay, so back on November 4th, I posted about my first three stops. This feels like it was a year ago. Then on November 21st, I posted about stops #5, 6, 7 and 8. That was, y’know, a couple months ago. This week, #9 I’m at Marie Symeou’s blog as part of a series of author interviews she’s running. Coming up are stops #10 through #15. Or maybe #16, I’m not sure which. I’ve also lost track of the exact dates for some, but here are the links and I’ll update this post as the details come. Heidi Hall, aka WriterGurl1, is running a flirty, fun, fantastic series of author interviews where we all answer important questions, especially one about sunglasses. Please look for my interview and be sure to check out the others, too. Especially if you like chick-lit! On December 13th, My indie, my tea and me is posting a review of Dolphin Girl. I have no idea what they’re going to say. LOL. So, it might seem like I’m taking a huge risk to post the link to their review and, well honestly, I am. But I’ve said to everyone that it’s an honor for someone to invest their time to read my book. I’m also grateful for bloggers who think critically about their reviews and this blog does. So, that’s why the link, before the rating. Besides, deciding to indie pub was a much scarier risk, so you already know I’m a little like five-year-old Jane — either really brave or really stupid. The Indie Book Collective is running a Blowout for the Twelve Days of Christmas (December 12-24). I’m one of the featured books on December 15th. There’s no interview or post with this stop, but if you visit their site any time during the promo you can enter to win a gift cards, gift baskets and a Kindle! PLUS, you’ll find lots of e-books on sale. Home. On December 3oth. I’m doing a Five in Five interview with Whatcha’ Reading Now? which was a lot of fun because I got to answer silly, random questions! Plus as a bonus I got to hang with writer-pal Kerry Cerra. Plus, I’m giving away a signed book to someone who is randomly drawn from Kerry’s magic coffee mug. Then after the first of the year — January 10-15 to be precise — I’ll be at the Great Minds Read Aloud Literary community, which is sorta like a book club, sorta like a review blog, has a forum and is pretty cool. But wait! That’s 2012 and I’ll post again before then. Also, I’m pretty sure (but not completely sure) that there will be another stop or two mixed in there, but I’ll catch you up on those later. December 7, 2011. Tags: author interview, blog tour, Dolphin Girl, Great Minds Think Aloud, Heidi Hall, IBC, Indie Book Collective, Kai Strand, Kate Ellison, Marie Symeou, My indie, my tea and me, Whatcha Reading Now. Uncategorized. Leave a comment.